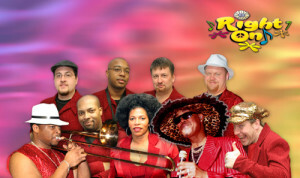 Right On is an authentic “ten-piece show band” with a full horn section. They have performed all over the world including Ethiopia, Italy, Canada, the Dominican Republic, and the Bahamas. They have had the honor of performing for three United States Presidents and the US Congress at the White House as well as other dignitaries and heads of state around the world. Right On is known for their outlandish 70’s costumes, but can also perform in formal attire if so desired. Specializing in Motown, Disco, and 70’s Funk, they also have the ability to perform 80’s Retro, Standards, and Beach Music as well. Right On carries its own “state-of-the-art” sound and lighting production and also travels with its own professional sound man, lighting director, and production crew. The band also coordinates all of the details for each event with the venue and event contacts. Nothing ruins a good party more than when the band takes too many breaks. That does not happen with Right On EVER: the band will not take a break unless you ask them to.